"The America I know and love is not one in which my parents or my baby with Down syndrome will have to stand in front of Obama’s ‘death panel’ so his bureaucrats can decide, based on a subjective judgment of their ‘level of productivity in society,’ whether they are worthy of health care. Such a system is downright evil." But the truly astonishing part is that The Wasilla Wonder has actually framed the entire debate with her disingenuous reference designed to scare the crap out of old folks and those who care for them. "Death panel" has now become the official catch-phrase and rallying cry of all the right-wing loons salivating at the opportunity to not just derail Obama's attempt at reform, but more importantly to undermine his nascent administration's entire agenda. Conservatives smell Obama's blood, and the health-scare mobs are just the front lines in the much more complicated war to take him down. 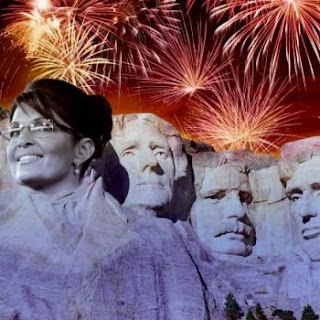 But I have to give Palin credit. For someone with the knowledge and intellectual curiosity of an Alaskan moose, she's sure demonstrating some deft political skills. What the health-care debate has proven is that in 'retirement' she's not crawling under any rocks just yet. For some strange reason, and I cannot for the life of me understand it, there actually are a whole bunch of people who hang onto every word this inarticulate, vacuous, empty-Versace-suited fraud has to say. That we as a nation are engaged in a bitter partisan battle over such an important subject as health care, with Palin's words leading the charge on the right, is absolutely mind-boggling. Maybe Republicans have been right all along: perhaps she is the future of their party. The ignorance regarding other countries health care systems is mind-boggling. Steven Hawkins said that he owes his life to the British NHS and yet these people shamelessly use his name to fight a public option. Let me interject a small personal example. When I get my daughter's med for hypothyroidism from Greece it is $3 a package of thirty pills and here we pay $30 for the same quantity as co-pay. Anyway, so we know what we are talking about here are two decent links to other countries systems and costs. So the same GOP media machine that claims in their unsigned, unattributed, unverified emails that Obama "offended" the Queen of England is silent when they offend the entire rest of the nation. Overall she has won the debate. she is going to be right smack in the middle of it all. Sarah Palin is looking happy because she has won the debate of Death panel. The mainstream media are a crock. They are owned by corporations that support the repubs big time. Without a public option, the Dems are doomed.